Guests of coach and tour operators brought to Excursions™ 2016 at Alexandra Palace, North London on Saturday, 23rd January will be invited to an afternoon session of 'Elizabethan Dressing' in honour of Shakespeare's 400 year legacy. As VIP visitors they will also have fast track entry and receive complementary drinks and a welcome bag with lots of goodies. In partnership with Shakespeare's Globe, guides will explain the intricacies of dressing and the significance of clothing in Elizabethan society. Do you know the origin of the phrases 'straight-laced', 'loose women' and 'pin money'? And what did Shakespeare's contemporaries use as a stain remover? Guests will be able to find out as they dress a willing group organiser as a character from a Shakespeare play. This opportunity is only open to coach and tour operators, and other travel trade professionals, bringing along a private coach of bonafide group travel buyers to Excursions™ 2016. Marcia Clement, Sales Manager at Shakespeare's Globe comments, "We are very excited to be demonstrating one of our most popular group activities, 'Elizabethan Dressing' in the VIP coach area at Excursions™ 2016 and to also bring to the show Elizabethan etiquette in the year the country will pay homage to the 400th anniversary of Shakespeare's death. We have been exhibiting at Excursions™ for many years, and it is a key show in our calendar for meeting a high calibre of group organisers from all sectors." Operators that have taken up this opportunity in the past have seen direct bookings as a result of taking their key clients to the show; it's also an excellent way to treat clients to a day out. RB Travel have been bringing a private coach party to Excursions™ for several years; "The VIP meet and greet leaves me with no worries as everything is taken care of", says Eileen Clarke. "95% of the group organisers I bring make bookings with contacts they meet at Excursions™ and all I get is positive feedback." To book a private coach arrival and benefit from this VIP experience, contact Sarah Hogger at show organisers Tourism South East on 02380 625 419 or visit the show's new website at http://www.excursions2016.com for more information; a familiarisation trip can also be arranged on route to the show. All visitors to Excursions™ will be able to discover more about the world famous playwright. Shakespeare's England, which is exhibiting at the show, will be commemorating the four centuries since his death with a range of exciting new exhibitions and events including an immersive theatrical experience by the Royal Shakespeare Company and the opening of his schoolroom at King Edward VI School, Stratford-upon-Avon to the general public for the first time. The Shakespeare Birthplace Trust is transforming New Place, the site of Shakespeare's home for the last 19 years of his life and where he wrote 26 plays, to create a new heritage landmark. This project is the most significant Shakespearean project anywhere in the world to commemorate his legacy. Unfortunately, New Place was demolished in 1759 by its then owner, Reverend Francis Gastrell, who was annoyed by visiting Shakespeare enthusiasts. The re-imagined New Place is scheduled to open on 23rd April, the date of his death. 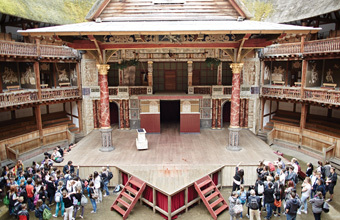 In London Shakespeare's Globe candlelit theatre, the Sam Wanamaker Playhouse is hosting the Bard's plays as part of its main season for the first time. In 2016 The Globe will is also holding a temporary exhibition containing the recently discovered Saint-Omer First Folio notable for its scribbled stage directions, offering valuable clues as to how the plays were performed over the centuries. With an expected attendance of 1,300 quality buyers and some 300 exhibitors from the UK and Europe, Excursions™ will be the place to meet, network and pick up new inspiration for group day trips, short breaks and holidays. Online visitor registration will open mid-September. Follow Excursions™ 2016 on Twitter @Excursionsshow for news and updates or visit the show's Facebook page at 'Excursions: Group Travel Trade Exhibition'. A video with highlights from the 2015 show can also be viewed on the website.